Today is the day I have been dreading for weeks. "La llama llorona esta llorando porque se perdió su llave." Clearly that lesson is about the "ll". I knew this day would come, I was simply waiting for the humiliation. One of the things I find most fascinating about languages, is the difficulties non-native speakers have when trying to pronounce difficult native sounds. 2. The German umlaut (ü) is one of the impassable barriers between my German and the German I would like to have. I once told a receptionist that I need to "push my paper" because I can't correctly pronounce the difference between "drücken" (to push) and "drucken" (to print). 3. Then there is the horrible rolling of the "r". This hinders me from distinguishing between words like "dog" & "but" and "car" & "expensive"
Today my kids learned the "rr". Last week they learned about "rr"'s weak Superhero friend, the single "r". This weak "r" is scared by vowels so he makes a very quiet sound. But strong "rr" isn't afraid and makes a loud rolling sound. The Spanish teacher left the room for a while so I had to help the students and needed to tell them words like "cart" and "vineyard," all with the "rr". I took to simply writing them down because I can't properly pronounce them and felt like I was hindering their understanding of the differences between the sounds. When the teacher came back, I sheepishly told her that I can't roll my "r"s and using hand drawn illustrations, showed me how I can properly train my tongue to make the sound. She finished her explanation by saying, "You simply need to train the tongue. Since there are very few strong sounds in English your mouth is weak." Hmph. At least I've still got "th". I have been working at the school for just over four months and so far we have had three earthquake drills. The first time, I knew we would be having a drill so I treated it appropriately. The second time I was walking back to my classroom from the printer when the siren sounded. There was a little jump in my chest, my steps quickened and I briefly thought, "Alright, here we go..." But alas, another drill. Two weeks ago was National Earthquake Drill Day so I was obviously prepared for the sirens. Last Wednesday, I was sitting in my classroom, eating my lunch when the sirens sounded. My first thought was, "Another drill? Seriously?!" I rushed out of the classroom to my designated concentration zone and waited for my children. Less than ten seconds later, I felt the ground move as if there was a wave beneath the concrete. Simultaneously, I looked across the courtyard and saw the windows shaking. During a drill, once everyone has gathered we move to a final evacuation point. But on Wednesday, the director simply said, "Nobody move and please be silent." In that moment I knew, this was for real. I would later learn that the tremor we felt in Lima was an effect of the 7.0 earthquake that hit Pucallpa, Peru, in the Amazon. Thankfully, there were only two dozen reported injuries from the quake. It was an interesting experience because it was my first tremor. I spent my childhood in Florida and college years in Tennessee so I am more familiar with hurricanes and tornadoes. Earthquakes are a whole new challenge for me. What we felt in Lima was so minor, that a lot of residents didn't even feel the movement. To be honest, the sirens heightened my awareness of the situation. Had they not sounded, I too might not have felt it. I was however, relieved to know that I was calm throughout the whole event. I had feared that my first earthquake would be a traumatizing experience. Thankfully, Peru was spared from major damage. Natural disasters seem to be all over the news this week. Thinking of all my fellow Americans along the eastern seaboard who are currently braving Irene's winds. I can't find a routine. Before quitting my language institute job, I daydreamed about how I would spend my newfound free time. I will go to yoga and Skype with my family. I will blog regularly and plan my meals. I will clean frequently and pick up writing again. I will be a über productive, creative machine. During my three week vacation, I accomplished very little. I had all these lofty goals for what I could get done but spent most of those weeks simply enjoying all the freedom. I went from a 70 hour work week to a 0 hour work week and couldn't get enough of doing nothing. Then I felt frustrated by what I perceived as lost time but was comforted by my dads' words that sometimes "it takes a while to be creative again." I'm back to working and am just now beginning to sort out my normal work week routine. Slowly, very slowly, it feels like I am developing a normal pace of life. Balanced between my job and caring for my apartment, my writing and myself, I can see a glimmer of the "normal" post-grad life I have been seeking since graduating well over a year ago. The only surprisingly, not very "normal" thing about it is that I happen to be doing all this in Lima, Peru. I sure didn't see that one coming while I was waiting to walk across the stage. But I have learned that normalcy fluctuates and this is where I am. Honestly, I couldn't be happier about my space in this little corner of the world. Take the expressway, exit at the main street and continue on for a while. The whole trip should take ten minutes. Or forty minutes with traffic. My first few months here, when I was trying to be a serious private language consultant, Alvaro's mom would drive me to my classes. "Pick me up at 7:15," I would say and without fail she was at my apartment at 7pm sharp. It drove me nuts. The predictability of her too-earliness made it worse. I would remind her, "I think 7:15 is better, it's just a short drive from here" to which she would reply, "Oh, but with traffic it's much longer." Inevitably, there was zero traffic and we were fifteen minutes early for my class. In those days, I wasn't allowed to be by myself (though that's an entirely different story) so I had to wait in the car with Alvaro's mom for fifteen awkward, Spanish stumbling minutes. The point? Traffic in Lima is a) horrendous and b) annoyingly unpredictable. Limeans measure distance in the traffic minutes it takes to get there. My trafficless morning commute would be about twenty minutes. A good traffic day is door-to-door in under an hour. Going just ten blocks can easily take over half an hour. Tonight my taxi was to pick me up and take me home. It wasn't there at the designated time, so I called the company. "Oh yes, Señorita, it will be there in four minutes." Did I mention that there's actual time and Peruvian time? I hear "four minutes" in Peruvian time which in reality is forty minutes. And "he's just three blocks away" translates to reality speak as "an arrival thirty minutes later". And the unpredictability. Several weeks ago, we went to a play at my school. Alvaro's parents advised us to leave a full hour and a half early because of all the "traffic." On a Saturday night? Unlikely. So we made out way about 30-40 minutes early. Imagine my surprise when the highway was a parking lot and it took over an hour to get to school. The unpredictability is maddening. The worst part? His parents were right. The only redeeming thing about all this chaos is that thankfully, I don't have to drive. I'm either sitting on a bus or as a passenger in a car. Driving in this mess is a whole different level of stress and there's no way I could acclimate to that. The first time I ordered coffee at Starbucks in Lima, the barista asked me, "What's your name?" Barista: looks really confused What!? That's my name in Spanish. The first syllable is pronounced like the month following April and the second syllable the past participle for "to go". To make things more confusing, the emphasis is placed on "gone". "Well if you are going to pronounce my name, May-gone, then I will call you whatever I want." The same went for his friend Daniel. In Spanish, it's pronounced like Danielle. Which messes with my head as I say, "Danielle" while looking at a man. Mayra? 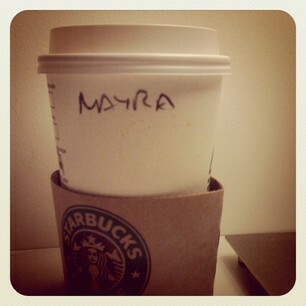 What is Mayra? It's not even close to "Meghan" or "May-gone". At least my latte was right. Pet stores simply don't exist in Lima. The "pet store" is simply a couple of shelves of pet supplies in the lobby of a veterinarian's office. Their entire stock could fit in my living room and there's little to no predictability about the products that will be available. My cat is a picky woman. She likes cold water, preferably as it is falling from the bottle. She only eats crunchy treats. For food flavor, she sticks to seafood unless it's the fancy canned stuff, then she'll branch out to chicken. And for a scratching post, she will only use cardboard. Oh that's right, or my couch. Months ago I found the perfect cardboard scratching contraption for her but she has clawed it to pieces. I've been searching for a decent replacement for weeks and unfortunately, the abysmal selection in Peruvian "pet stores" just isn't cutting it. Don't Peruvian cats need to scratch too? Where are all the scratching posts? We've been to nearly a dozen pet stores, even one that my boyfriend's aunts called "grandasa" (really, really big). To me really, really big is Petsmart. To his aunts evidently really, really big is a store that could fit in the cat adoption room at Petsmart. Not quite the same thing. So I have taken it upon myself to spoil my cat some more (and save my couch) by making a cardboard cat scratching post for Ms. Emmaline. Thanks to the world wide web, I have find some easy instructions. The doorman at my building saved some cardboard for me. I finally found a box cutter and now I'm good to go. 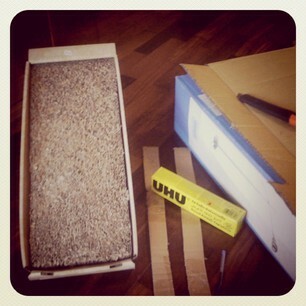 Let's just hope this picky cat isn't too picky for DIY projects.